Jost has produced a new step-by-step video guide to servicing a hydraulic cylinder, as part of a program to improve in-field servicing of its Edbro tipping cylinders. The program also includes extending the JOST service and support network, providing free cylinder care training to end-users, new service manuals and a series of other new videos. The new video covers all aspects of cylinder care and servicing in a straightforward format that can be viewed in its entirety or “dipped into” for quick refreshers before starting a particular task. It is based on following a servicing operation sequentially through each stage from receipt to sign off, demonstrating each process in clear but simple details, offering tips along the way and showing safe working practices at all points. Initially the cylinder to be serviced is oriented vertically so that the outer casing can be removed. Because of the weight involved, proper lifting gear, such as a powered overhead winch is required. The casing can then be cleaned, inspected and if necessary repaired or repainted. Using the lifting gear the cylinder is then placed horizontally onto a work bench so that dismantling, cleaning and inspection can begin. At this point the hydraulic fluid is drained from the cylinder, the video showing how care should be taken to ensure as much as possible is recovered. It is also notable that many of the components will be heavy and still slippery, so require careful handling to avoid knocks and damage. The video continues to show the dismantling process in detail, offering tips and tricks along the way for safe, efficient and effective progress. For instance, it recommends using an air line to assist in the removal of wear rings, always taking the time to remove any hydraulic oil that has accumulated and shows how to handle heavy and/or delicate parts. The next stage is thorough cleaning and inspection, removing dirt, grease, paint flecks, metal particles, etc, in fact anything that could compromise performance after reassembly. The inspection should identify scratches and other damage and a decision made whether to repair or replace each part. The video then goes carefully through the reassembly process, showing how seals, wear rings and other smaller parts are fitted into the large tubes and end plates. Again, there are useful tips, such as how to prevent rotation so that screw holes line up etc. 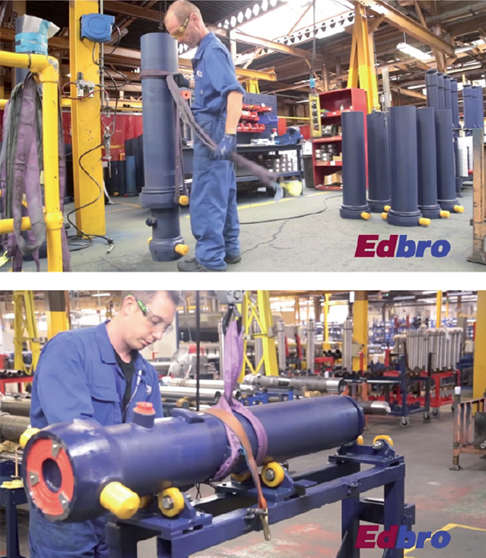 The new video is aimed at trained maintenance personnel, reminding them how to keep the EDBRO cylinders operational, safe, reliable and able to provide a long trouble free working life. Other new videos are in development and will be launched soon. JOST also offers full training to maintenance professionals new to tippling cylinder maintenance and servicing. This is free of charge and part of JOST commitment to its customers, so that they are able to run safe, reliable and profitable transport operations.